The Third National convention of the ISA was held in Philadelphia in 1926 with 70 people present. The Chairman of the Convention was Mr. A.F.W. Vick, father of Al Vick. The eleventhconvention was also held in Philadelphia with J.G. Heimicke, Chairman, and attended by 261 members. The 33rd convention was in 1957 and attended by 716 registrants. 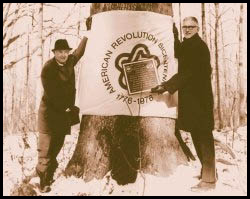 J.C. Kenealy, Tree Commissioner of Lower Merion Township was the chair and Hyland Johns was on the committee. The field day was held on Carl Asplundh’s farm and a chipper was auctioned. At that convention, so much excitement was generated at how well it went that talk began about starting a chapter. As an outgrowth of the 1957 Convention, Jack Kenealy, with Hyland Johns and Al Vick Jr., gathered a few men in the Township Building of Lower Merion Township in Ardmore to form a chapter in Pennsylvania. The meetings were held about every two months at the Bartlett Tree Company office in Bala-Cynwald. In 1960 Kenealy was elected President of the ISA National organization. That was also the year that he started the Jamboree for rope throwing and climbing. This event was held in Ashbridge Park in Lower Merion. The Charter was granted at the Convention held in Boston that year. At the 1963 Convention in Toronto, the members from the Pittsburgh area wanted to join the Ohio Chapter and so split the State. The Philadelphia group succeeded in getting the motion tabled and were then able to get it passed at the Texas Convention to keep the state together and formed the Penn-Del Chapter. 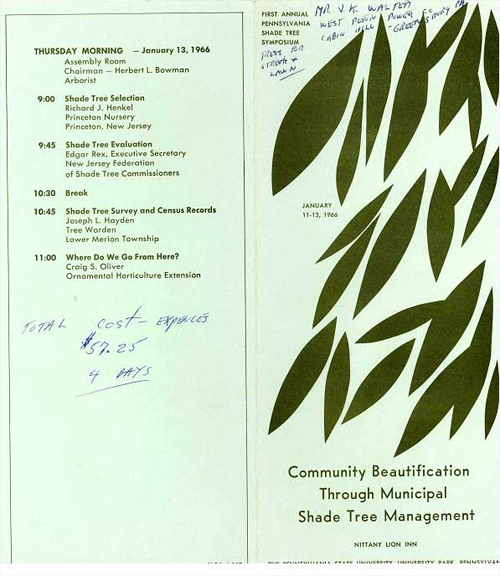 By 1966 the group that had formed under the leadership of Jack Kenealydecided to sponsor a Symposium for the tree men in the state. It was held at Penn State with the hope that it would attract men from all over the state. By far the largest number came from the Delaware Valley area. Ron Harper of the Philadelphia Electric Company was instrumental in spearheading the meetings held the second week in January at the Nittany Lion Inn. Andy Anderson from Texas, the National President, attended and helped to get the Symposium off to a good start. Most of the speakers were from the University or members of the chapter. Plans were also under way for the 1967 convention that was held at the Marriot Motor Hotel under the Leadership of Hyland Johns. This Convention involved most of the active members of the chapter and was a success with an attendance of 806. By 1971 it was felt that traveling to Penn-State in January was too difficult when most of the attendance was coming from the area around Philadelphia. So that year the Symposium was held in Fairmount Park at the Horticulture Hall. Since it hit on a sub-zero week it was very cold, but still produced one of the best attendances that the chapter had seen up to that time. After this success, the Symposium was moved to the Marriot Motor Hotel. This was also the year that the Cooperative Extension Service approached the group and suggested that both organizations join forces. The College of Agriculture is charged with the responsibility of shepherding the activities of Agriculture in the various counties, especially in the field of education. As they had watched the growth of the Penn-Del chapter, they realized that it represented a growing area in agriculture, and one they felt should be addressed. So, rather than have two symposiums annually, it was decided to join forces to the benefit of both. The speakers were often the professors from the University who kept us informed of the new developments in research and shared with us their extensive knowledge in the field by presenting well-illustrated talks. Because of the desperate need for climbers in 1973, the Tree Climbing School was started in conjunction with Penn State. This was a two-week course held annually in the spring in Fairmount Park to reach men how to get into a tree, and down. There was no climbing taught in the Schools of Agriculture at that time, and the companies who did teach it, discontinued it during the 1930’s. A teacher is hired and the students were sent by the companies that they worked for. In the first ten years of its existence, approximately 150 graduated, some of who have been women. For a number of years starting in 1967, the Penn-Del chapter had a booth at the Philadelphia Flower Show. The exhibit was a demonstration of good pruning practices sometimes with alive climber in the trees. Others covered cavity work, tree fertilization andother woody plant care such as to the planting for the homeowner. Ed Martin gave generously of his time and talent to set up these exhibits assisted by the Fairmount men and others in the chapter. Several of our members have hadtheir own booths in this outstanding show, winning many awards: The most consistent being Al Vick with his wild flower natural display. The Tree Fertilization Project carried out by Roland Daniels of Penn State was sponsored by the Penn-Del Chapter. The trees that were selected for the project were on the Scott Foundation and Longwood Gardens. This was a three-year project that tried to determine the best tree fertilizer for trees in a hostile urban environment. The 1977 Symposium was the forerunner of the international convention that was held at the Marriot Hotel in Philadelphia under the leadership of Robert McConnell and attended by 782. This was the year that Hyland Johns was International President of the ISA. The 1979 Symposium was moved to the Holiday Inn in King of Prussia for several reasons; cost and location being two. This meeting has become the annual update for the renewal for the Pesticide Applicators License that is issued annually. At the present time, certification for arborists is about to become a reality after several years of work by the chapter under the leadership of John Ward. The Symposium had grown to 420 persons the first day, and375 at the second sessionthis year with 31 exhibitors. In 1961, Jack Kenealy was instrumental in getting House Bill #224 passed making Arbor Day the last Friday in April, recognized in the State of Pennsylvania. The Arbor Day Committee of the ISA, headed by Harry Banker of New Jersey, established the Gold Leaf Award for outstanding Arbor Day Programs. The Penn-Del chapter has participated in this program by awarding 4 to Fairmount Park, Richardson Middle School, Springfield Township, Delaware Co., Upper Merion Township and the Greenville Tree Corporation, Greenville, Delaware. The chapter has established a Memorial Grove in Fairmount Park where there has been a tree planted annually as a memorial to a deceased member. At that time, the chapter was one of the larger ones in the ISA and had a member on the Board of Directors and on 6 of the standing National committees, as well as 6 on the Board of Governors. The Award of Merit was presented to Dr. John C. Swartley of the Penn-Del Chapter in 1970 and to Edgar G. Rex in 1976. The Author citation was given to Dr. Lester Nichols of Penn State. There are 4 honorary Life Members: Hyland R. Johns Jr., Robert C. McConnell, Edgar G Rex and Clayton M. Hoff, the first two of these being past presidents of the ISA. Robert C. McConnell was on the board of Directors of the Research Trust and 20 of our members have contributed as well as the chapter itself, through fund raising activities. In 1977 the Morris Arboretum was a recipient of a grant from the Trust and Penn State received one in 1979. 1977 – The chapter held its first local Jamboree at Naylor’s Run Park in Upper Darby. Bill Graham and Andy Moore were two of the participants and both went onto compete at the international contest held at the Marriot Motor Lodge in Philadelphia where Bill Graham won the line-throwing contest. Bill and his father also won the cross-cut saw competition and received a chainsaw and a radio as prizes.